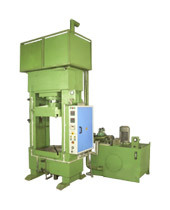 Ace Bakelite machine have higher standards in performance, more flexibility and more efficiency. Also, in order to cater in customer's different preferences, we can build custom-made moulding machines to fit customer needs. Low wear, low friction pads bearing on wide 45° surfaces on the press columns guide. The moving table and eliminate lateral movement. This ensures consistently accurate molding to close tolerances with minimal use of tool dowels. The Cylinder assembly is complete with bushes wiper seal and 'O' ring to give leak proof operation. All rod seals and piston seals used are imported and reputed polyurethane make.